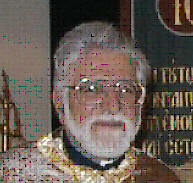 Throughout the Orthodox World in various languages a greeting is heard during this period of time. The greeting…the good news…..Christ Is Risen! 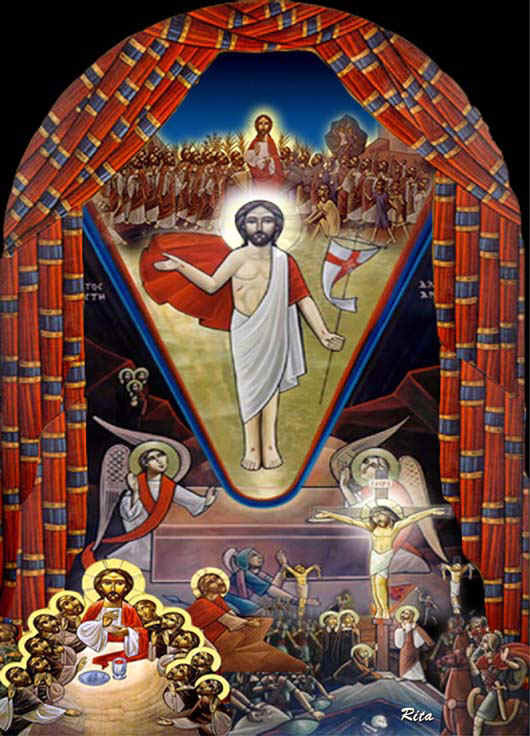 It is once again Pascha…Easter…the celebration of Christ’s Resurrection. "God is the Lord, and hath revealed himself unto us. O come, let us make a ready feast, let us magnify Christ with gladness and with palms and branches of trees, crying aloud unto Him in hymns: Blessed is he that comes in the name of the Lord." (9th ode of the first canon of Palm Sunday). "This day illuminates the beginning of the suffering of the Lord. Come, therefore, O friends, let us meet with hymns: for the Creator comes, humbling Himself on a Cross, to trial and to blows and to the judgment of Pilate. Moreover, smitten on the head by a servant, He submits to all things so that He may save mankind. Wherefore let us cry; Oh Merciful Christ our God, grant forgiveness of sins, to those who worship in faith Thy Holy Passion." (Doxastikon from Holy Monday Vespers). "Today is hung upon the Tree, He Who suspended the land in the midst of waters…He is transfixed with nails, Who is the Son of the Virgin…We worship Thy Passion, O Christ. Show also unto us Thy glorious Resurrection." (15th Antiphon of Holy Thursday Evening). On Good Friday, during Vespers, we witnessed the body taken from the Cross and placed in the tomb. In the evening we joined our voices in singing the Lamentations. "The sun darkened his light and shuddered when he saw Thee, O Christ, the unseen Light, bereft of breath, and hidden in the grave." (Lamentations, 2nd Part). We experienced triumph turned to tragedy. Yet, within the service we understood hope…hope of ever-lasting life. "I worship Thy Passion, I praise Thy tomb, and I magnify Thy power, O merciful Master, by which I am set free from corrupting ills." (Lamentations, 1st Part). "Arise O God, and judge Thou the earth; for Thou shall take all heathen to Thine inheritance." (Holy Saturday morning). Finally we reach Saturday night…we stand in a darkened Church in silence, in anticipation, in awe…a lit candle comes forth from the altar in the hand of our clergy as we are invited to receive the Light of the Resurrection. "Come ye and receive light from the unwaning Light; and glorify Christ, Who has risen from the dead." "Christ is risen from the dead, by death trampling upon Death, has bestowed life to those in the tombs." ‘Christ is Risen…Truly He is Risen." Yet, I can not help but ask myself if the scenario described above was a reality for each of the Orthodox Christians in each parish throughout the world. If I do, the answer would sadly be a resounding "NO". Possibly many would say: "But I did go to Good Friday Services." Yes, that probably is true. "It is a beautiful service and I wanted to see how the Epitaphion was decorated," some would say. Or, "It was always a tradition in my family to go to Church on Good Friday." Midnight service on Holy Pascha probably found most of our Churches with standing room only…up until the first singing of "Christ has Risen…"…then… a mass exodus. People hurrying home to break their red Easter eggs and to eat their traditional Easter supper and this not because they are weak and feel faint from having fasted during Great Lent and Holy Week. The next day, each greets the other with the triumphal Easter greeting, carefully picks a ‘winning’ red Easter egg, and attempt to crack the other’s egg. Everyone sits down to a traditional dinner of either lamb or pork depending on the ethnic background, and FEAST. But do they realize why they are feasting? Do they realize it is Pascha? Or is it nothing more than a traditional ethnic holiday from their past which they now continue to observe? "calf is a fatted one. Let no one go away hungry." And they take it literally. They don’t read the next sentence to realize this is a metaphor. "Partake ye all of the cup of faith." St. John is not talking of that richly laden dinner table with crystal and china, food and wine. He is exhorting us to receive our Resurrected Lord, His precious Body and Life-giving Blood from the Chalice, the Cup of Life-- Holy Communion. I have given this sermon in the past as a take home exam to my classes in Classical Rhetorical Theory and have asked my students to analyze the sermon using various classical theories. They, non-Orthodox and many of them non-Christians, have a sounder understanding of the sermon than many of our Orthodox who are steeped in tradition rather than in the Orthodox faith. My former students recognize the richness of the metaphor referring to Christ, the Redeemer, the Life-giver, the Savior. They are in awe at the joyous solemnity of Pascha. The question is, are we? Is Pascha for us a spiritual thanksgiving or an ethnic feast day?